Before I knew it, it was over. I was almost to my destination and had just crested the summit of the final hill when it happened. Instantly, I was in the midst of a large mass of blazing wings and angry eyes, and found myself back at the loading screen just as quickly. 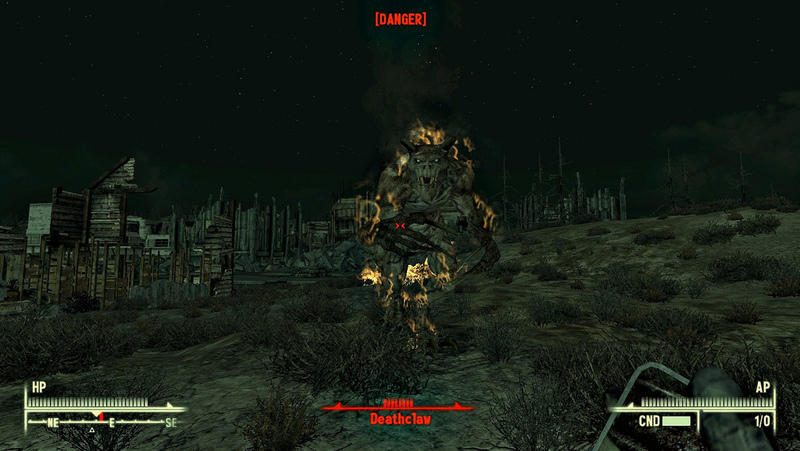 I had just learned a valuable lesson of the wasteland: certain death could always be waiting just over the next hill. That was an excerpt from one of my recent adventures in Fallout: New Vegas, a game that’s funny and lighthearted until one finds out just how harsh the post-apocalyptic Mojave can be. Swarms of jerk-bugs aside though, I can’t help but wonder if “The Courier” ever actually gets a taste of the true Mojave wasteland; the one which supposedly punishes even the smallest mistakes with grievous injury or even death. The wasteland certainly looks the part: little to no vegetation, irradiated water, and scores of nightmarish creatures would definitely ensure that survival would at the very least be difficult for anyone who isn’t as exceptional as a player-character. So how is it that so many have not only survived, but survived well enough to start bringing civilization back to the wasteland? It seems to me that humankind in the post-apocalyptic world of Fallout shouldn’t be faring quite as well as it is. First and foremost, we have water. How did they deal with the irradiated water? Sure, the vaults and areas transformed by G.E.C.K.s (Garden of Eden Creation Kits) might have a supply of fresh water, but what about the roaming tribes and bands of raiders? They’d certainly have to drink irradiated water, and I doubt they’d ever have enough “RadAway” to constantly cleanse themselves of radiation, so I find that to be a bit of a problem. Food presents a similar issue. If just about everything in the wasteland is irradiated to a mostly intolerable level, then where are the remnants of society getting their food? There shouldn’t be any wildlife suitable for consumption due to the general radiation found in the wastes, and they shouldn’t be able to farm for the same reason. Old world preserves should be just as invalid an option since most of it is also irradiated to some degree. Again, unless the survivors are located in a shielded or transformed area, it seems unlikely that they’d be able to eek-out much of a life for themselves. However, these are but minor problems when compared to all of the absolutely savage varieties of wildlife that now occupy the wastes. I realize that the wasteland has to be the way it is for us to have some sort of challenge, and I really do like it as it is. I just find the level of disconnect between the world described by the game and the world we encounter as “The Courier” to be kind of funny. The wasteland we know should have been absolutely inhospitable to humans, while the wasteland the NPCs know would be a cakewalk for our player characters. Though I have to say, I wouldn’t mind the toned-down version of the cazadors that most wasteland inhabitants seem to have encountered. The ones I know are the absolute worst! What do you think of the Fallout wasteland? Any other game worlds come to mind that should be harsher for the average inhabitant?